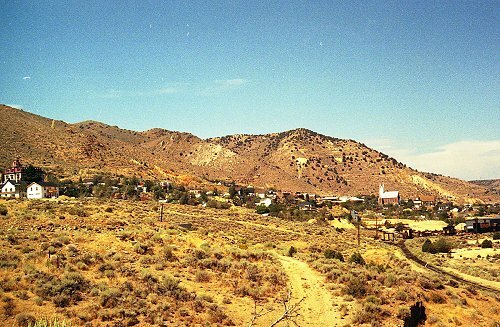 Middle frame of the panorama, showing the central section of Virginia City, which stands at an elevation of 6,200 feet. The school is on the left, the white-steepled church on the right. On the lower right can be seen tracks of the Virginia and Truckee Railroad, which runs trains for tourists from May through October.